"I like this recipe because it is not fried and very tasty. I like to make it healthier by using whole wheat breadcrumbs and reducing the amount of fat. Also, by using mostly egg-whites instead of whole eggs I am able to reduce the cholesterol level." Beat together egg, egg whites, and water in a shallow bowl. Dip eggplant slices in egg, then bread crumbs. Place in a single layer on a baking sheet. Bake in preheated oven until fork tender, 7 to 10 minutes on each side. Spread spaghetti sauce to cover the bottom of a 9x13-inch baking dish. Place a layer of eggplant slices in the sauce. Sprinkle with mozzarella and Parmesan cheeses. Repeat with remaining ingredients, ending with cheeses. Sprinkle basil on top. Bake in preheated oven until golden brown, about 35 minutes. 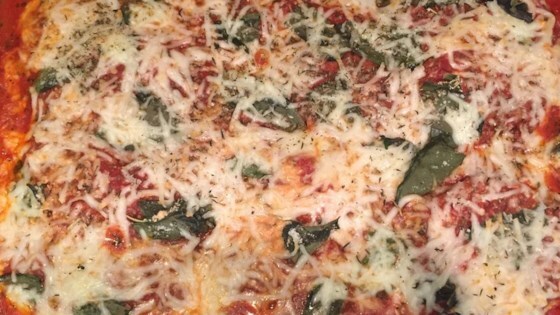 See how to make a delicious no-fry version of eggplant Parmesan. This recipe is a healthier version of Eggplant Parmesan II. Made this last night for dinner. I cut the recipe in half since I was just cooking for myself, but I followed everything else exactly. Turned out GREAT! This was a winner. Made a few changes based on what i had available, Panko and Provolone instead of whole wheat and mozzerella. It was fantastic.